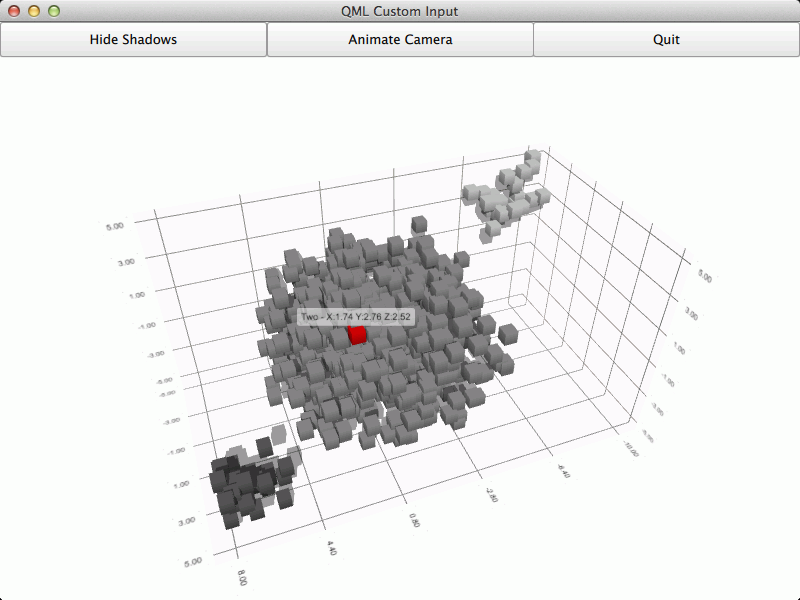 The Qt Quick 2 Custom Input example shows how to customize the 3D graph controls from Qt Quick 2 using the MouseArea to capture and process mouse events in QML. Custom input handling code in this example shows how the camera is now controlled by using NumberAnimation to animate the camera and item selection is done on mouseover rather than clicking any mouse buttons. Also the code shows how to implement similar zoom with mouse wheel functionality as the default input handler implements. The default input handling mechanism is disabled by setting the inputHandler property to null. The on mouseover selection handling is implemented using standard MouseArea to capture the mouse events. The mouse area is configured to capture hover events and has two custom properties for mouseX and mouseY to store the last known mouse coordinates. Whenever a pointer movement related signal is received the code updates the mouseX and mouseY properties. The camera is animated to constantly rotate around the graph with two animations. The rotation around the graph is done with a simple NumberAnimation that just increments during 20 seconds from 0 degrees to 360 degrees and sets the Q3DCamera::xRotation property. The camera movement up and down is implemented with a SequentialAnimation that varies the Q3DCamera::yRotation property of the camera from 5 degrees to 45 degrees and back with in and out easing.